My Take - At some point this is going to become so extreme the very people governing Europe will become the targets. What then? Will these multicultural leftists recant and realize they've negotiated an suicide pact between Europe and Islam? No, I think they're just as insane as Obama the leftists here in America. At some point the people of Europe will have all they can stand and there will be a civil war, or a revolution if you will, and violence will erupt on a scale not seen since WWII. Then what? The multicultural leftists will be replaced with tyrannical nationalist leftists. The economy will have collapsed, and may be unfixable, the conditions will be dystopic and Muslims will be expelled with the resulting violence. Europe is doomed forever as a major economic or military power. They're breeding themselves out of existence. This will the final death stroke of the EU and most of western Europe. Eastern Europe may end up saving Europe as a whole since they understand the insanity of leftists ideology, having suffered under communism for so many decades. Perhaps another John III Sobieski will arise to lead them. If France wants to survive they have better find another Hammer of France like Charles Martel. However by then - Europe will be bankrupt and might not be able to recover - ever - and forever being economically exiled into the third world. Guess who these arrogant condescending European elitists will then turn to for a bail out? But that door is closing fast, and by then - by 2020 America's economy will be facing a massive depression that will make the Great Depression seem mild. And there will be no baby boomer capital generators among the working generations. America will be in the midst of a ten year economic mess we won't be able to climb out of until 2030. The world has gone insane! And can anyone tell me whether Hollande has lost his mind or is he really just stupid! My Take - Well.... I agree, that's exactly what they're doing, and I hope they continue because the supremacy of western values based on Judaic/Christian principles, compared to the rest of the world - especially the Islamic world - is staggeringly overwhelming. And the young need to become aware of that. 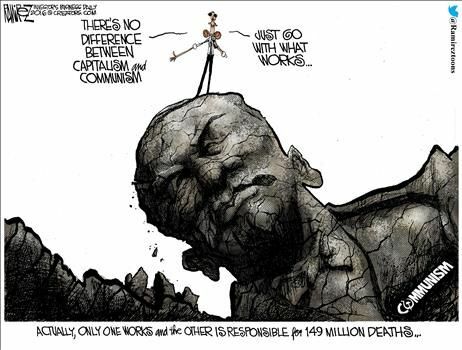 My Take - Another example of cognitive dissonance and Orwell's "newspeak" from the left - and in this case from a unaccomplished delusional egomaniac who has done more to destroy world peace and the security of the west than anyone since Adolf Hitler. My Take - Solution? Expel all Muslims and declare Islam is a political criminal movement masquerading as a religion, and the fact they've managed to that successfully for 1400 years is immaterial. Then tell the leftists around the world who object to go and pound salt. See - clarity! My Take - "It’s serious – especially on Easter Sunday with people gathering" Well Duh! And this is waking these people up to what????? After all - this can't be Islamic terrorism because Obama doesn't believe in that. Right? (of a treatment or medicine) relieving pain or alleviating a problem without dealing with the underlying cause. a palliative remedy, medicine, etc. I have read about the paradoxical alliance between Islam and the left for years. I have even written about it -- at some length, in fact, in my newest book Scarlet Letters. But it was only a few weeks go that I got to see up close the mechanisms that allow people who celebrate homosexuals to find common cause with those who, when the law allows, happily sever their heads. As a result of my book, I was invited to sit on a panel titled “Muslim in the Metro,” an event sponsored by an enterprise called American Public Square and televised in edited form -- fairly, I must say -- on the regional PBS channel here in Kansas City, KCPT. However if you use the words “Islamic terrorism” or even milder derivatives such as “radical Islamic terrorism”, you are playing into the hands of ISIS. If you call for closer law enforcement scrutiny of Muslim areas before they turn into Molenbeek style no-go zones or suggest ending the stream of new immigrant recruits to ISIS in San Bernardino, Paris or Brussels, you are also playing into the hands of ISIS. And if you carpet bomb ISIS, destroy its headquarters and training camps, you’re just playing into its hands. According to Obama and his experts, who have wrecked the Middle East, what ISIS fears most is that we’ll ignore it and let it go about its business. And what it wants most is for us to utterly destroy it. Or as Canadian prime minister Justin Trudeau said, "If you kill your enemies, they win." Every single counterintuitive strategy for defeating Islamic terrorism has been tried. And it has failed. Overthrowing “dictators” turned entire countries into terrorist training camps. Bringing Islamists to power in Egypt, Libya and Tunisia led directly to attacks on American diplomatic facilities. The Muslim Brotherhood showed no gratitude to its State Department allies. Instead its militias and forces either aided the attackers or stood by and watched while taking bets on the outcome. The counterintuitive strategy assumes that Islamic terrorism will only exist if we use the I-word, that totalitarian Jihadist movements want democracy and that our best allies for fighting Islamic terrorism are people from the same places where Islamic terrorism is a runaway success. And that we should duplicate the demographics of the countries where Islamic terrorism thrives in order to defeat it. If you believe the experts, then Islamic terrorists want us to stop them from entering Europe, America, Canada and Australia. They crave having their terrorists profiled by law enforcement on the way to their latest attack. And they wish we would just carpet bomb them as hard as we can right now. After the San Bernardino shootings, Obama insisted that, “Our success won’t depend on tough talk or abandoning our values... That’s what groups like ISIL are hoping for.” But ISIS does not care whether Obama talks tough, even if it’s only his version of tough talk in which he puffs out his chest and says things like, ”You are not strong, you are weak.” It is not interested in Obama’s “right side of history” distortion of American values either. Just ask the dead of Brussels, Paris, New York and a hundred other places. This isn’t a plan to win. It’s a plan to confuse the issue while losing. It’s a plan to convince everyone that what looks like appeasement, defeatism, surrender and collaboration with the enemy is really a brilliant counterintuitive plan that is the only possible path to a lasting victory over Islamic terrorism. The Entomological Society of America (ESA) and Sociedade Entomológica do Brasil (SEB) held a Summit in Maceió, Alagoas, Brazil on 13 March, 2016 to discuss the Aedes aegypti mosquito, which is the primary transmitter of Zika, dengue, chikungunya, and yellow fever. With her eyes bulging wildly, grotesque contorted facial expressions, and a cackle Margaret Hamilton (the Wicked Witch of the West in “The Wizard of Oz”) would envy, Hillary Clinton attacked Donald Trump, saying that being president “shouldn’t be about delivering insults but about delivering results.” Delivering results juxtaposed to delivering insults is something in which Hillary is well versed. For example, rather than deliver insults as a strategic plan to keep her husband and then-president from being found guilty during his impeachment proceedings, she delivered results. For more information please go to the Ohio Right to Life site. In Columbus, the Ohio Right to Life team is hard at work on initiatives that will prohibit abortion violence and protect the dignity of its victims. Now that we have successfully de-funded Planned Parenthood of 1.3 million taxpayer dollars, we are continuing on the path to pass Ohio's Pain-Capable Unborn Child Protection Act and the Unborn Child Dignity Act. If you are in the area, please join Dayton Right to Life at Woodland Cemetery, section 204 today at noon. While providing pertinent points, the Politico list is just a sampling. One missing item on the “mistrust” litany is a project she reportedly cooked up as Secretary of State, but that was shaped by her family foundation. State Department staff sent official emails to solicit funds from foreign governments. The project sounds innocent enough: “to save lives, improve livelihoods, empower women, and combat climate change.” What miracle product can do all that? A cookstove. Yes, that is correct—a cookstove. This is not the product of “as seen on TV” wizardry, nor is it the latest in high-efficiency appliances. There’s something fishy when governments throughout the world (including the U.S), corporations (including Bank of America, Goldman Sachs, and Johnson & Johnson), and Ted Turner’s UN Foundation and the Clinton Global Initiative are involved as they are with the Global Alliance for Clean Cookstoves (Alliance). No one would begrudge corporations giving to a philanthropic effort, but we would probably feel differently about our own tax dollars going to the project Clinton is hawking—especially when the project is, by most accounts, an epic fail. To remedy this problem, it would make sense for the well-funded public-private partnership to use its money and influence to help build natural-gas-fueled power plants and infrastructure to bring electricity to the developing world. But that was not Clinton’s idea. “Progress” in the Alliance can be attributed to her influence as Secretary of State. Before the announcement of the Alliance, Kris Balderston, who served as her special representative for global partnerships, on his state.gov account pressured Norway to join. They obliged with a commitment for a $600,000 “down payment.” Apparently, as emails revealed, the country wanted to be part of the launch: “They wanted to move quickly for the CGI announcement.” (Note: Norway is a major donor to the Clinton Foundation.) Once Norway signed on, France and Finland were expected to follow suit. While traveling the globe, on the taxpayers’ dime, Clinton recruited more partners. All big charity programs have celebrity spokespersons—the Alliance has actress Julia Roberts and chef Jose Andres—but Clinton was much more. She is credited with the program’s birth. While Secretary of State, it was “on the top of her agenda.” Once retiring from her official duties, Clinton became the Chair of the Alliance’s Leadership Council—where she still serves. While at best, Clinton’s clean cookstove campaign seems slimy, and may be illegal, one might cast a blind eye if the program achieved its aggrandizing goals. Rather than burning biomass, experts believe that gas, electricity, or both would be better at protecting health. Kreutzer agrees: “These cookstoves seem to be substitutes for efforts to provide affordable modern power to those in need”—which he says condemn so many of the poor to continuing energy poverty. 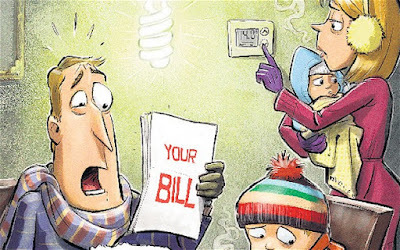 Sadly, Alliance members oppose projects that would provide low-cost power to these poor households. You have to wonder, if these cookstoves—which are more like a hibachi grill than a stove and cost about $25—don’t achieve the stated goals, why is Clinton such a proponent? As Christine Lakatos, whom I have worked with on dozens of green-energy, crony-corruption reports, and who alerted me to this dirty story, found in her Green Corruption File report, Alliance work was a high priority during Clinton’s time as Secretary of State. The project spanned eleven federal agencies and, so far, totals more than $114 million. If Clinton becomes president, her energy policies will likely enact a cap-and-trade system or a carbon tax—which would suddenly make her cookstove project profitable. Rather than helping bring modern power to the world’s poor, she’s, as Kreutzer calls it, “prolonging energy poverty for millions upon millions in the developing world.” And that is the dirty story behind Clinton’s clean cookstove campaign. I’m never surprised when politicians make absurd statements, but I’m still capable of being shocked when other people make outlandish assertions. Like the leftist policy wonk who claimed that capitalism is actually coercion, even though free markets are based on voluntary exchange. Or the statist columnist who argued people aren’t free unless they’re entitled to other people’s money, even though that turns some people into unfree serfs. Now I have another example of upside-down thinking. It deals with the “inversion” issue, which involves American-chartered companies choosing to redomicile overseas. A column in the Huffington Post implies that Pfizer is some sort of economic traitor for making a sensible business decision to protect the interests of workers, consumers, and shareholders. Pfizer…wants to turn its back on America by claiming to be an Irish company through an offshore merger, giving it access to Ireland’s low tax rates. The change would only be on paper. The company would still be run from the United States, enjoying all the benefits of being based in America—such as our taxpayer-supported roads, public colleges, and patent protections—without paying its part to support them. There’s a remarkable level of inaccuracy in that short excerpt. Pfizer wouldn’t be claiming to be an Irish company. It would be an Irish company. And it would still pay tax to the IRS on all U.S.-source income. All that changes with an inversion is that the company no longer would have to pay tax to the IRS on non-U.S. income. Which is money the American government shouldn’t be taxing in the first place! Here’s more from the article. Pfizer could walk out on its existing U.S. tax bill of up to $35 billion if its Irish tax maneuver goes forward. That’s what it already owes the American people on about $150 billion in profits it has stashed offshore, much of it in tax havens. Wrong again. The extra layer of tax on foreign-source income only applies if the money comes back to the United States. Pfizer won’t “walk out” on a tax liability. Everything the company is doing is fully compliant with tax laws and IRS rules. Here’s another excerpt, which I think is wrong, but doesn’t involve misstatements. When corporations dodge their taxes, the rest of us have to make up for what’s missing. We pay for it in higher taxes, underfunded public services, or more debt. The “rest of us” aren’t losers when there’s an inversion. All the evidence shows that we benefit when tax competition puts pressure on governments. By the way, the author wants Obama to arbitrarily and unilaterally rewrite the rules . President Obama can stop Pfizer’s biggest cash grab: that estimated $35 billion in unpaid taxes it wants to pocket by changing its mailing address. There are already Treasury Department rules in place to prevent this kind of overseas tax dodge. As now written, however, they wouldn’t apply to Pfizer’s cleverly-crafted deal. The Obama Administration needs to correct those regulations so they cover all American companies trying to exploit the loophole Pfizer is using. It already has the authority to do it. Needless to say, Pfizer can’t “grab” its own money. The only grabbing in this scenario would be by the IRS. Since I’m not an international tax lawyer, I have no idea if the Obama Administration could get away with an after-the-fact raid on Pfizer, but I will note that the above passage at least acknowledges that Pfizer is obeying the law. Now let’s look at some analysis from someone who actually understands the issue. Mihir Desai is a Harvard professor and he recently explained the reforms that actually would stop inversions in a column for the Wall Street Journal. Removing the incentive for American companies to move their headquarters abroad is a widely recognized goal. To do so, the U.S. will need to join the rest of the G-7 countries and tax business income only once, in the country where it was earned. …Currently, the U.S. taxes the world-wide income of its corporations at one of the highest rates in the world, but defers that tax until the profits are repatriated. The result is the worst of all worlds—a high federal statutory rate (35%) that encourages aggressive transfer pricing, a significant restriction on capital allocation that keeps cash offshore, very little revenue for the Treasury, and the loss of U.S. headquarters to countries with territorial tax systems. In other words, America should join the rest of the world and adopt a territorial tax system. And Prof. Desai is right. If the U.S. government stopped the anti-competitive practice of “worldwide” taxation, inversions would disappear. That’s a lesson other nations seem to be learning. 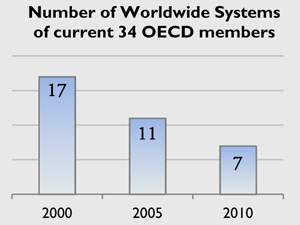 There’s only a small handful of countries with worldwide tax systems and that group is getting smaller every year. Japan in 2009 and the United Kingdom in 2010 shifted to a territorial tax regime and lowered their statutory corporate rates. The U.K. did so to stop companies from moving their headquarters abroad; Japan was primarily interested in encouraging its multinationals to reinvest foreign earnings at home. Professor Desai closes with a broader point about how it’s good for the American economy with multinational firms earn market share abroad. …it is mistaken to demonize the foreign operations of American multinationals as working contrary to the interests of American workers. Instead the evidence, including research by C. Fritz Foley, James R. Hines and myself, suggests that U.S. companies succeeding globally expand at home—contradicting the zero-sum intuition. Demonizing multinational firms plays to populist impulses today. But ensuring that the U.S. is a great home for global companies and a great place for them to invest is actually the best prescription for rising median wages. Amen. You don’t get higher wages by seizing ever-larger amounts of money from employers. This is why we should have a territorial tax system and a much lower corporate tax rate. Which is what Wayne Winegarden of the Pacific Research Institute argues for in Forbes. …why would a company consider such a restructuring? The answer: the uncompetitive U.S. corporate income tax code. Attempts to punish companies that are pursuing corporate inversions misdiagnose the problem and, in so doing, make a bad situation worse. The problem that needs to be solved is the uncompetitive and overly burdensome U.S. corporate income tax code. The U.S. corporate income tax code puts U.S. companies at an unsustainable competitive disadvantage compared to their global competitors. The corporate income tax code in the U.S. imposes the highest marginal tax rate among the industrialized countries (a combined federal and average state tax rate of 39.1 percent), is overly-complex, difficult to understand, full of special interest carve-outs, taxes the same income multiple times, and taxes U.S. companies based on their global income. Mr. Winegarden also makes the key point that a company that inverts still pays tax to the IRS on income earned in America. …a corporate inversion does not reduce the income taxes paid by U.S. companies on income earned in the U.S. Following a corporate inversion, the income taxes owed by the former U.S. company on its income earned in the U.S. are precisely the same. What is different, however, is that the income that a company earns outside of the U.S. is no longer taxable. Let’s now return to the specific case of Pfizer. Veronique de Rugy of the Mercatus Center explains in National Review why the entire inversion issue is a classic case of blame-the-victim by Washington. 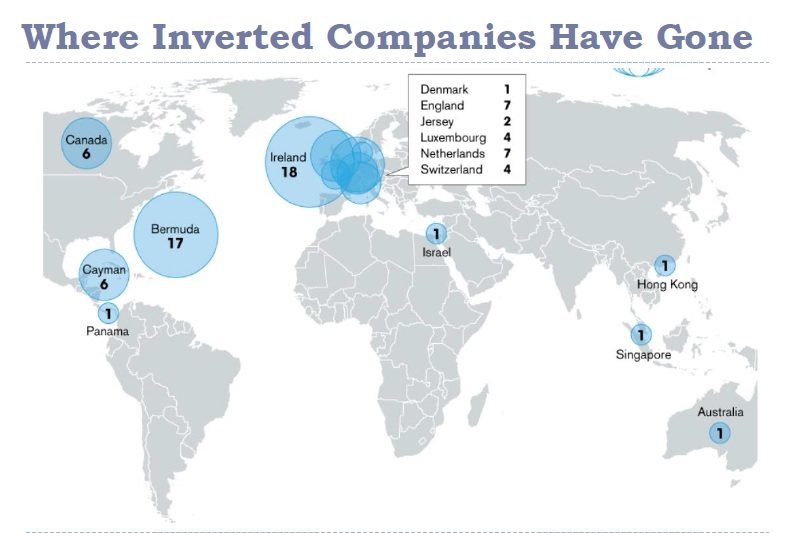 Almost 50 companies have chosen to “invert” over the last ten years. More than in the previous 20 years. …there are very good reasons for companies to do this. …for American businesses operating overseas, costs have become increasingly prohibitive. …Europe now sports a corporate-tax rate below 24 percent, while the U.S. remains stubbornly high at 35 percent, or almost 40 percent when factoring in state taxes. …it’s the combination with America’s worldwide taxation system that leaves U.S.-based corporations so severely handicapped. Unlike almost every other nation, the U.S. taxes American companies no matter where their income is earned. …So if a U.S.-based firm does business in Ireland they don’t simply pay the low 12.5 percent rate that everyone else pays, but also the difference between that and the U.S. rate. Veronique explains why Pfizer made the right choice when it recently merged with an Irish company. That’s a sensible reason to do what Pfizer has done recently with its attempt to purchase the Irish-based Allergan and relocate its headquarters there. The move would allow them to compete on an even playing field with every other company not based in the U.S. Despite the impression given by critics, they’ll still pay the U.S. rate when doing business here. And she takes aim at the politicians who refuse to take responsibility for bad policy and instead seek to blame the victims. 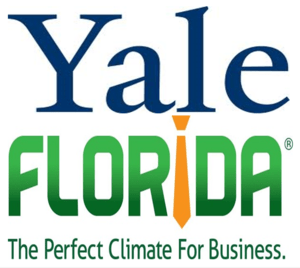 …politicians and their ideological sycophants in the media wish to cast the issue as a moral failure on the part of businesses instead of as the predictable response to a poorly constructed corporate-tax code. …Clinton wants to stop the companies from moving with an “exit tax.” Clinton isn’t the first to propose such a silly plan. Lawmakers and Treasury officials have made numerous attempts to stop businesses from leaving for greener pastures and each time they have failed. Instead, they should reform the tax code so that businesses don’t want to leave. Let’s close with an observation about the Pfizer controversy. Perhaps the company did make a “mistake” by failing to adequately grease the palms of politicians. Consider the case of Johnson Controls, for instance, which is another company that also is in the process of redomiciling in a country with better tax law. Brent Scher of the Washington Free Beacon reports that the company has been a big donor to the Clinton Foundation, which presumably means it won’t be targeted if she makes it to the White House. Hillary Clinton has spent the past few months going after Johnson Controls for moving its headquarters overseas, but during a campaign event on Monday, her husband Bill Clinton said that it is one of his “favorite companies.” …He described Johnson Controls as “one of my favorite companies” and praised the work it had done in the clean energy sector during an event in North Carolina on Monday. …Johnson Controls has contributed more than $100,000 to the Clinton Foundation and also partnered with it on numerous projects over the past eight years and as recently as 2015. Some of the Clinton Foundation projects included multi-million commitments from Johnson Controls. Bill Clinton pointed out in his speech that his foundation has done business with Johnson Controls—something that Hillary Clinton is yet to mention. For what it’s worth, the folks at Johnson Controls may have made a wise “investment” by funneling money into the Clinton machine, but they shouldn’t delude themselves into thinking that this necessarily protects them. If Hillary Clinton ever decides that it is in her interest to throw the company to the wolves, I strongly suspect she won’t hesitate. 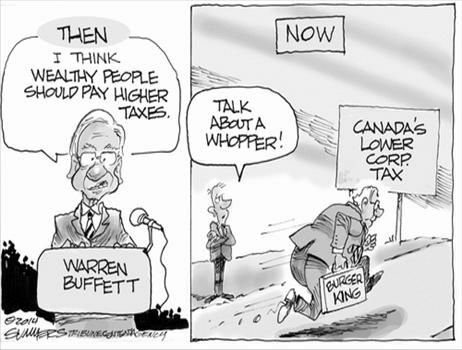 Though it’s worth pointing out that Burger King didn’t get attacked very much by the White House when it inverted to Canada, perhaps because Warren Buffett, a major Obama ally, was involved with the deal. But wouldn’t it be nice if we had a reasonable tax code so that companies didn’t have to worry about currying favor with the political class? "I Was Only Good at Enjoying It"
Don't Trust Europe the Risk is Too Great! The Cover-Up of Wolves and What They DO! Burussels: The Failure of Western Leadership! Does Wildlife Depend on Government?